Rohan Dennis (Team BMC) went out on the Time Trail course through the streets of Utrecht, Netherlands about three hours before last years Tour de France winner, Vincenzo Nibali. A long wait at the Grand Depart but he held on to his lead with a breathtaking ride, covering the 14.8 km route in less than fifteen minutes (14′ 56″). The 25 year old from Adelaide averaged 55.4 km/hour along this short but technically challenging route, making him the seventh Australian ever to take the coveted Yellow Jersey. Dennis recorded the fastest time trial in the history of the Tour de France today. Earlier this year, he took the cycling One Hour record covering a distance of 54.491 km before being overtaken in subsequent attempts by British riders Alex Downsett and then Sir Bradley Wiggins. 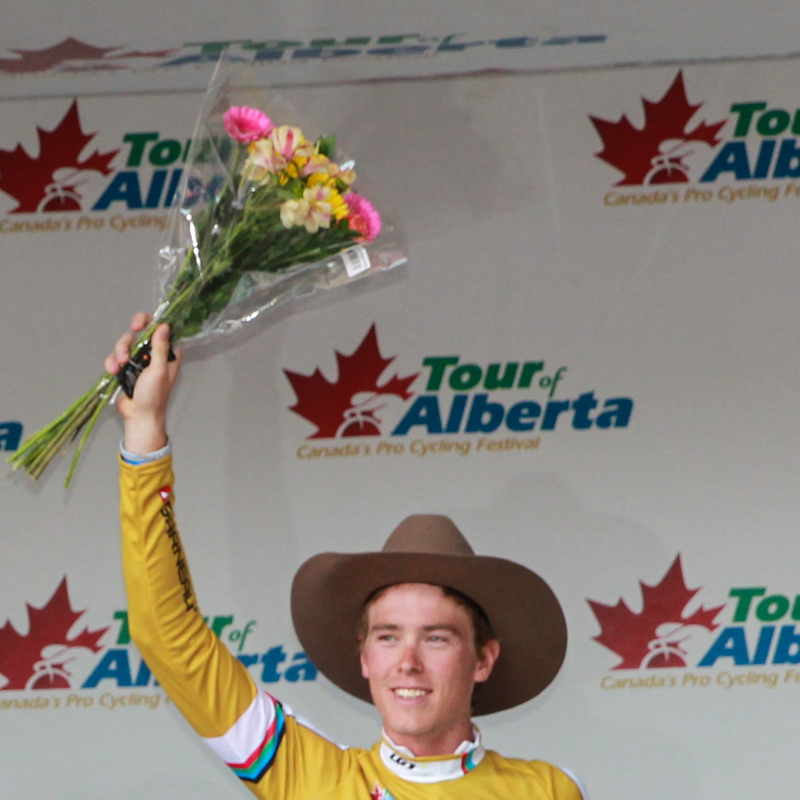 Back in 2013, Dennis was the General Classification overall winner of the inaugural Tour of Alberta, where he also took the Young Rider Award plus one of the coolest ever cycling prizes: a 65 million year old dinosaur bone for winning the Drumheller stage. Here is a photograph from his Albert Tour win.